Phoenix's philosophy is that they love either very cheap instruments or very expensive, high-quality ones. The French indie-rock band's sound is a blend of poppy hooks and sonic charm, with the band using a combination of guitars, vintage synthesizers, and toy keyboards. Their 2009 album Wolfgang Amadeus Phoenix won a Grammy for Best Alternative Music album, and was co-produced by fellow Frenchman Philippe Zdar of the synthpop duo Cassius. Zdar is also an avid lover of vintage synths. He mixes on analog desks to create a driven, focused mix. Both Phoenix and Zdar are big fans of the Yamaha CS-80, a legendary vintage synthesizer notable for being one of the earliest polyphonic synthesizers, and for being used in the Blade Runner soundtrack. The CS-80's sound quality is first-rate, and it truly embodies the character of analog synths. It is also a true performance instrument, with extra capabilities such as velocity control, aftertouch, and a ribbon controller. CS-80s are rare, heavy, and super expensive, but luckily Arturia has created a faithful software emulation called CS-80 V.
Phoenix also use the Korg Trident frequently, typically for creating huge bass sounds, such as in the "1901" intro. As the name implies, the Korg Trident has three independent sections: synth, strings, and brass. The synth and brass sections are similar to the Korg Polysix, and the string section of the Trident features a unique bowing effect. The Trident also has an onboard flanger effect. Korg haven't released a software version of the Trident, however they have released a software Polysix emulation that sounds similar to the synth section of the Trident. Phoenix also love cheap toy keyboards, such as those made by Casio and Yamaha. Keyboards they have mentioned in interviews or used live include the Casio SK-1, SK-5, and Yamaha VSS-200, which are all sampling keyboards that the band use to sample their voices to use as pads. They also use the Casio MT-65, Yamaha PSS-480, PSS-380, and PSR-64 for lo-fi keyboard sounds. These lo-fi kids keyboards typically use simple synthesis to create their sounds, and can be created in any software synth. I'll use the Arturia Mini V to create some lo-fi keyboard sounds, as it's versatile, sounds good, and has powerful programming features. For the 2014 album Bankrupt!, the band also used a Moog Memorymoog for the song "Don't," and an ARP Solina String Ensemble for "Chloroform." The enormously huge bass sound in the intro to "1901," the lead single from Wolfgang Amadeus Phoenix came from the bands Korg Trident, specifically its synth section, and the patch utilises the Korg's unison feature to stack multiple versions of the same note, all slightly detuned. To get the sound a little thicker, raise the cutoff knob to 9 and resonance to 5. Phoenix's bass sound is then heavily compressed and has been lightly overdriven, which may have come in the mixing stage, likely added by Philippe Zdar pushing the sound on an analog mixing desk. You can achieve similar effects in a DAW by adding heavy compression with a high ratio (think around 10:1), and an overdrive effect with a low mix amount to retain the clarity of the original signal whilst adding some grit. The instrumentation in "1901" is accompanied by some of the cheap keyboards the band love. Although it's impossible to identify exactly which keyboard is responsible for producing which sound, it's actually pretty easy to recreate the sounds using any synthesizer. The keys to programming these sounds are to have the filter closed to keep the sound dull, use small amounts of the noise oscillator, and generally avoid using envelope modulation or effects. Check out the organ and keys sounds of "1901" as played the videos above on Arturia Mini V. Both were programmed using a mix of Mini V's tri-saw and sawtooth waveforms. The chorus of "1901" sees Phoenix use the Yamaha CS-80 for some playful siren effects. Here they're using the CS-80's ribbon controller, basically a horizontal strip that acts as a pitch-bend controller. The CS-80 was designed for performance, and has a sustain mode that allows the ribbon to only modulate notes held on the keyboard, while leaving notes sustained with the sustain pedal unaffected. You can set this up in Arturia CS-80 V by making sure that the Sustain switch (bottom left) is set to "pedal," the Sustain Mode switch is set to "normal" and the sustain time fader is maxed out. Now you can connect a MIDI controller to CS-80 V and use a sustain pedal (or sustain switch, depending on your keyboard setup) to sustain long notes while using the pitch-bend wheel to only bend notes held down. The same technique is also used in the outro of the song "Rome," where it sounds like the CS-80 has been run through a fuzz effect. "Countdown" features a similar cheap keyboard and Korg Trident bass combo, with the keys playing piano-like arpeggios and the Korg providing the growling bass. To create the piano sound you'll want some rich-sounding oscillators, so set the first two oscillators to triangle and saw-triangle waveforms tuned to 8', and the third to a narrow-rectangular waveform tuned to 2'. This last, high-tuned oscillator will brighten up the sound—make sure its volume in the mixer section is lower than the first two oscillators, otherwise it will sound harsh. Create a plucking effect by lowering the cutoff frequency all the way and raising the amount of the contour knob to above the 5 mark. Set the decay time to 1000ms and sustain to the 2 mark. Raising the attack knob slightly will eliminate clicking noises from the sound, so raise it to around 8ms. For the growling bass sound, again start with Korg Polysix's initial Fat Bass Line preset, and again max out the sustain and reduce the release in the envelope. Raise the EG intensity slightly to open up the sound. To achieve the growling character of the sound, I ran the Polysix plugin through Soundtoys Devil Loc Deluxe, with the Crunch and Darkness knobs boosted high, and the Mix knob set lower to retain some of the original signal. "Girlfriend"'s main keys hook comes from one of Phoenix's cheap keyboards, and sounds like a lo-fi piano preset. The base sound is simple and can be created in a synth patch using square waves with adjustable widths. In Arturia Mini V set up a single oscillator patch that uses the wide-rectangular waveform (second to the right) and lower cutoff frequency to the -1 mark to dull the sound. In the loudness contour section lower sustain to 0 and set decay to the 600 mark to create a percussive fade out similar to a real plucked instrument. This patch is accompanied by a similar sounding lo-fi organ patch that has a full sustain to ring out fully while the keys are pressed. There is also a CS-80 track added to bring in some of that "high quality" sound—this is a simple saw patch that uses the filter envelope to create a plucking effect. The track "Lisztomania" features a waspy-sounding bass that also came from the Korg Trident. This can also be created from scratch in Mini V, which actually specialises in fat bass sounds. Set up two oscillators, the first a wide rectangular wave set to 8', and the second a standard square wave set to 16'. If you're following the tutorial with another synthesizer, just adjust the pulse-width of the first oscillator to create the wide rectangular waveform. Close the filter a little by setting the cutoff frequency to just above the -1 mark (640 Hz) and raise the emphasis (resonance) to 2. "J-Boy," from Phoenix's most recent album, 2017's Ti Amo, is a dancy, synth-laden song with a sparkling production. It's built on a Prince-influenced beat, and the bass sounds like it came from Trident, playing a syncopated pattern off the drums. It is the standard Korg-style unison bass we've used so far, this time utilising the Trident's built in flanger effect. The Polysix plugin we've used so far doesn't have a flanger effect, so add one from your DAW to get a subtle flanging effect. The detuned main synth achieves its wild sound from an LFO routed to the oscillators, creating a vibrato effect. In CS-80 V the LFO modulations are done via the sub oscillator section—so set the speed fader to 5.26hz and the VCO fader next to it to 0.0194 for a subtle vibrato. For the arpeggio that runs through the song, you just need to use one oscillator layer on the CS-80, although you could create a second layer to create some cool morphing tricks if you wish. The patch is a sawtooth waveform run through the LPF (low-pass filter) with the cutoff set to 750 Hz. The CS-80 has an unusual envelope system, with an initial level (IL) setting the beginning frequency, the attack level (AL) setting the maximum frequency, and the attack time (A) setting the time taken to go from the IL level to the AL level. To create the ARP's plucking effect, set the attack level to 0.5200 and the decay time to 105Hz. Make sure the Brilliance and Resonance faders at the bottom of the interface are set to their middle position. Use the CS-80's built-in delay effect with a delay time of 300ms and the mix set to about 25%. You can hear the delay effect being raised when during the descending riff at the end of the 8-bar section. The CS-80 is used prominently in "Armistice," where it plays the song's brassy synth stabs. The sound is classic CS-80, and you'll want to set up each oscillator layer mostly the same and use the Detune Ch II fader to create the fat, analog-style width. Set both oscillators as sawtooth waves with the low pass filters set to 1000 Hz and 500 Hz. Set both envelopes with an IL of 0.1600, AL almost maxed out, a super-short attack time of 20ms, and a decay time of 300ms. You don't need to set both layers' envelopes to be exactly the same, and some small differences between them will make the patch sound more interesting. Set the Mix fader to halfway and the Brilliance fader all the way up. Lastly, I couldn't do a Phoenix piece without looking at "Too Young," from their debut album United. The synth part sounds almost unmistakably like a Roland Juno-106, which the song's producer Philippe Zdar was using with Cassius around the time of the recording. The patch is easy to set up and makes use of the Juno's classic chorus effect. TAL U-NO-LX is a great Juno emulation plugin, and to set up the sound, turn off the sub oscillator, lower the cutoff frequency fader to 6, raise resonance to 2, and turn on the chorus II effect on the right of the interface. This is a simple but sweet patch great for adding a lush synth layer to any song. 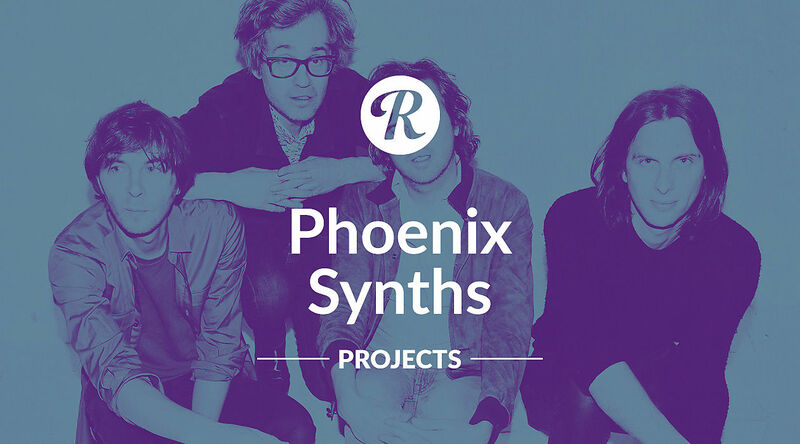 Phoenix prove that inspiration can come from gear of any price, from toy Casio and Yamaha keyboards, to analog synth beasts like the CS-80 and Korg Trident. Try keeping an eye out for inexpensive toy keyboards to add to your collection, play around with the patches on them, and use them to craft new sounds of your own. About the Author: Dan Carr runs Reverb Machine, a website dedicated to exploring "the wonders of synthesizers and music production." Check out his site for more breakdowns of popular artists' use of synths and unique recording techniques. Above, you can download the Arturia software synth patches used to recreate Phoenix's tones—and the Ableton Live sessions for each track.